A creamy and smooth Double Dutch Chocolate flavor that delights the mouth with a distinct taste. 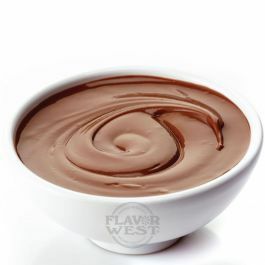 Type: Double Dutch chocolate water soluble flavoring. Ingredients: Natural and Artificial Flavoring and Propylene Glycol. USP Kosher Grade Flavoring. Usage Rate:15-20% for E-use. Flavor Suitability: Drinks and beverages, desserts, pastries, candies, lip balm and more. Specific Gravity: 1.05 No Refunds on Flavoring. I thought it was pretty good on its own but with a little caramel added, it is my absolute favorite vape. I bought some of this earlier in the year and was not successful at making a good mix of E juice. It was missing something and I could not figure it out until yesterday. I added a mix of ethyl maltose to it and when I got the ratio right it produced a heavenly vape! Reminds me of fudge brownies. I have to say that of all my DIY juices, this is my favorite.